Is a reasonable competency in the so-called ‘domestic arts’ of plumbing, carpentry and putting up shelves a vital step in the journey towards equality or is it best to let a man in a van handle these things? As I work from home, I tend to have the pleasure of explaining the leaky radiator/dubious plasterwork/eccentric door fixings to whoever comes knocking. This has led to a number of ‘interesting’ exchanges – most hilariously, the recent reference to the lack of kids about the place (“Do you not have a family?” asked Mr Victorian Carpenter, bemused by my obviously female presence being seemingly devoid of signs of ankle-biters. “No,” I replied, “I sold my infants on eBay to pay your extortionate bill”). Given the barrage of downright sexist rubbish that has plagued me for the past six weeks, I have been giving serious consideration to my lack of skills. Personally, I feel that a healthy respect of water/electricity/heavy mortar falling on your head is a good thing, but the unpleasant stigma of being ‘just a girl’ when it comes to tackling home improvements has led me to question my position. I firmly believe that everybody, whether male or female, should be able to handle the basic necessities of everyday living (changing a plug, fixing a leaky washer, repatriating a recalcitrant spider, etc). However, I also know that, in many instances, other people are better at things than I am, be that shearing sheep, developing a cure for diabetes or fixing toilets. So, while I do not necessarily expect my plumber to churn out a 3,000-word article on the technology publishing market in the Middle East, neither do I assume that I have any great insight into the complex workings of a Victorian plumbing system. As such, is DIY a feminist issue, or am I simply fooling myself? Is a reasonable competency in the so-called ‘domestic arts’ of plumbing, carpentry and putting up shelves a vital step in the journey towards equality or is it best to let a man in a van handle these things? A predominance of single households (thus removing any option of any one member having any proficiency in DIY) and – importantly – a lack of trained apprentices progressing through the old ‘skilled trades’, could, in theory, lead an increasing number of people, particularly women, to be left at the mercy of ‘old school’ types. Whether that is because householders do not have the knowledge to perform certain tasks (and, let’s be honest, rewiring a house requires skills that can’t really be picked up out of a library book over a spare weekend) or don’t feel comfortable letting a bunch of strange men into their house while they are otherwise indisposed, surely there must be a way of addressing this concern? In response to this, a number of companies, trade associations and training providers across the UK have put real time and effort into addressing what has been the traditionally male-dominated influence in plumbing, carpentry, electrical engineering and painting and decorating. Schemes have been put into place to not only to help women to broaden their knowledge and to positively encourage women into careers such as carpentry, plumbing and decorating in order to provide clients (particularly female clients) with an increased body of choice. Women and Manual Trades, the leading membership organisation for women working in the manual trades, was formed in 1975 as a direct result of the feminist movement. Developed and led by women for women, the organisation now has 400 members nationwide and aims to represent and support women working and training in skilled manual and craft occupations. In addition to its representative and lobbying activities, WAMT provides support for women looking entering the industry, courses for those who do not necessarily wish to qualify but want to ‘upgrade’ their skills and campaigns to improve women’s access to education and employment in the sector. However, women working in the trades is not necessarily the ‘revolutionary’ stepping stone that some media commentators would have us believe. 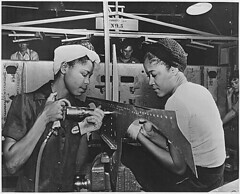 As Welburn explains, thousands of women were employed within the industry during the Second World War and, in fact, London’s Waterloo Bridge was primarily constructed by female teams. Following the war, however, tradeswomen were – like most women employed in ‘male’ occupations – sent home. When it comes to encouraging women back into the sector, Welburn believes that education is the key to empowering women and helping them to achieve their goals – whether (like me) that is simply learning some practical DIY skills or taking up full-time positions in the construction industry. She explains: “Working in the trades and construction industry represents a genuine chance for women to explore opportunities outside of the traditional ‘five Cs’ of caring, cashiering, catering, cleaning and clerical which have historically dominated women’s choices of employment. In March, the organisation launched an online database of members at www.wamt.org. Householders looking for services can browse the database by region, trade and keyword and members can advertise their services. One such member, self-employed plumber Kate Churchill, has been working in the sector for more than 20 years. After finishing university, she worked as an administrator for a smalI plumbing company, before being taken on as a trainee. Some men were really unpleasant to us – they’d spit on the van when we went to the builders’ merchant for supplies or actually even verbally threaten us. After taking a few years out to have her children, Churchill then set up her own businesses and refreshed her qualifications by completing a National Vocational Qualification at the College of North West London. 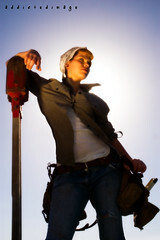 Undoubtedly, the work is out there for female tradespeople – Churchill suggests clients often trust women more. The rewards of the job go beyond the financial, too: “What I love about plumbing is that I’m problem-solving, especially when clients have previously had a couple of plumbers round, who have said ‘Ooh, that’s really difficult’, and I go and say ‘No it isn’t, that’s really easy – I can fix that in an hour!'”. In addition to the work carried out by organisations such as WAMT and individual women within the trades, other women are using the increasing demand for female tradespeople to develop successful businesses. Having worked in the City for seven years, former investment banker Kerrie Keeling, aged-33, was looking for a challenge. Following a ‘horrible’ experience with a tiler, she decided to use her knowledge and skills to set up a property maintenance, design and building business which would apply the ethos and principles of a professional company. In 2003, A Woman’s Touch began to take shape – having attended short courses on plumbing, tiling and decorating in various London colleges, Kerrie began taking on business herself. Five years later, the company has expanded exponentially. It now turns over £1.2 million and employs 20 staff, 17 of whom are female. Accredited by the Federation of Master Builders and the Guild of Mastercraftsmen, the company has offices in Brighton, Wimbledon, Cambridge and Spain, and plans further expansion. But as Keeling explains, getting the business going was not necessarily a smooth ride: “Initially, some men were really unpleasant to us – they’d spit on the van when we went to the builders’ merchant for supplies or actually even verbally threaten us. However, Keeling is not sitting on her laurels – as a patron of WAMT and an active campaigner for women in construction, she’s keen to encourage more women to participate. While there can be no doubt that encouraging women to break into a potentially lucrative and satisfying career which has historically been disbarred to them, does this wave of empowerment extend to women like me, who simply want to be able to put up some level shelves without electrocuting themselves? Keeling is sure this is achievable: “This is all about equality for all – professionals, homeowners and those women who simply want to make themselves a bit more independent.